There are several components of the work of equipping intercessors for which PRMI needs your prayer support. We need to pray for God to raise up someone to help with ministry publications. Pray for God to protect us from Satan’s counterattacks that take place by cutting off financial support. Pray for the team headed to South Korea in order to offer the Mountain Top Equipping Camp for Intercessors. Continue reading to hear about the extraordinary time we had at the Mountain Top Equipping Camp for Intercessors and Spiritual Warriors and to learn how to pray for the areas of ministry mentioned above. A critical part of being able to do this work of intercession and take part in engagements with the demonic powers aligned against the Kingdom of God is doing After Action Reviews. We had an extraordinary Mountain Top Equipping Camp for Intercessors and Spiritual Warriors at the COC. The teaching/leadership team consisted of The Rev. Cindy Strickler, Rev. Doug McMurry, Messianic Jewish Rabbi Mark Rantz, Rev. Martin Boardman, Kim Krog and myself. Some very exciting things happened! Among them is the development of a deepening link with the Jewish Messianic ligament of the body of Christ. This link is essential for the army of intercessors to have the unity needed to defeat Satan’s terrible plans and to advance the Kingdom of God. But more on that in a later blog. I am in the process of doing a full After Action Review of that event but there are some issues that the Holy Spirit is impressing upon me as more urgent for our prayers. Danielle King has been called out of our PRMI office where she was providing very competent help in editing and distributing our publications/communications. Her departure has put a huge burden on Mary Ellen and Chris Walker for getting these communications out. We need someone who is not just good at publications but who gets the ministry, shares our same biblical worldview, vital faith, commitment to Jesus Christ and to the work of the Holy Spirit advancing the Kingdom of God. Obviously, it takes some growing into such a position. Please pray for the Lord to bring to us just the right person with the qualifications needed. And ask Him to please do it soon! Communication is a critical aspect of the entire ministry operation. In obedience to Jesus Christ we are offering equipping for intercessors and have deployed a number of cohorts in the USA, Canada, and England. Further cohorts are being formed and are stepping into intercessory prayer engagements. There is so much taking place on so many different warfronts that it is obvious that the Holy Spirit is the one directing this prayer and spiritual warfare. Just for instance, on July 2nd Martin and I led prayers breaking the death curses spoken by a Muslim cleric from the Temple Mount in Jerusalem, calling for the slaughter of Americans and Europeans. You can join in this prayer against these curses by reading our previous blog post, “Prayers to Break Curses Spoken from the Temple Mount”. We received an amazing response and great affirmation in this work of prayer. Most meaningful were from those in Israel, attesting to how important this intercession is. Praise God! But as we have seen before, Satan has been attacking back. This takes many forms; some personal, like waves of discouragement or communication break downs, but right now it seems that the devil is once again blocking our financial support. Summer time is always difficult but right now it is extra hard financially. 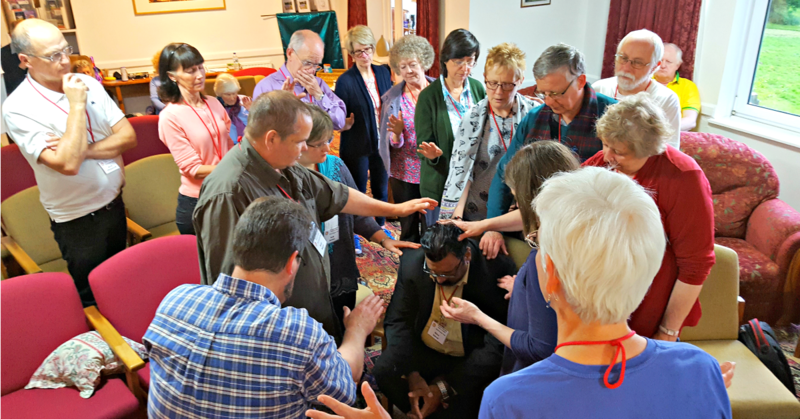 So please pray for the Lord to provide all the financial support needed to both run the ministry, sustain ongoing ministry as well as continue to develop the prayer work. Satan knows that when Christians start praying the extraordinary prayer that advances the Kingdom of God then his evil empire is under threat. So please join us in praying for provision! We really need more gifts coming in to meet the cost of this work and to continue to move into the future. We have prepared for a long time to take the Mountain Top Equipping Camp teaching to South Korea. South Korea (and the Church in South Korea) is a major strategic prayer and missionary sending base for the worldwide movement of the Holy Spirit. We are called to take part in bringing to them this advanced teaching on discerning and cooperating with Jesus Christ in defeating demonic strongholds and advancing the Kingdom of God. Some have expressed concern that with increasing tensions between South Korea, the USA, Japan, and North Korea that this does not seem like a safe time to go. As I have prayed about this I trust that if we are not to go that the Lord will make that clear. However, I am convinced that we are to go and that Jesus is sending our team there in order to partner with our Korean brothers and sisters in this global work of intercessory prayer in order to be the solution to this growing tension and threats of war. It is one thing to say that the safest place to be is in God’s will and another to put that in practice by getting on an airplane and going to a meeting where God’s plans will be carried out and Satan’s plans will be exposed and, in prayer, defeated. So, please pray for the team going. It will include Cindy Strickler, Martin Boardman, and me (Brad Long) joining with Ben and Liz Torrey, Sarah Lee, and others in Korea to form the teaching and leadership team. The Korean team has already done the crucial work of translating the Tactical Manual into Korean. We really need your prayer support as we will need to adapt this teaching to meet the needs in Korea. Please pray for a great outpouring of the Holy Spirit and for protection of all those called to be involved. Martin Boardman will be sending out notices to you as we move into this engagement. To sign up to receive these updates, please click here. But please start now to pray for us. If you have any guidance, please let us know right away by emailing Martin Boardman at martinb@prmi.org. Thank you for pursuing this great adventure with us. Hi Rev. Brad: I have told you before that I can help with editing Publications. I worked as the Editor’s Assistant for Aerospace Industries Association in Washington, DC. editing all of their print media; contributed to the publication of two industry newsletters for that organization with a readership of over 5,000; and I wrote the company newsletter. I have a Masters in English and edit my own  books, and have written a newsletter for my ministry for over seventeen years. I am retired and can work part-time if you are interested in interviewing me. I can email you a Resume. I have a pretty good understanding of PRMI, and am in agreement with your beliefs, and would love to help you do the great work that you do around the world. let me know if you are interested.